I met him when I was about two-years old, shortly before he passed away in 1979. 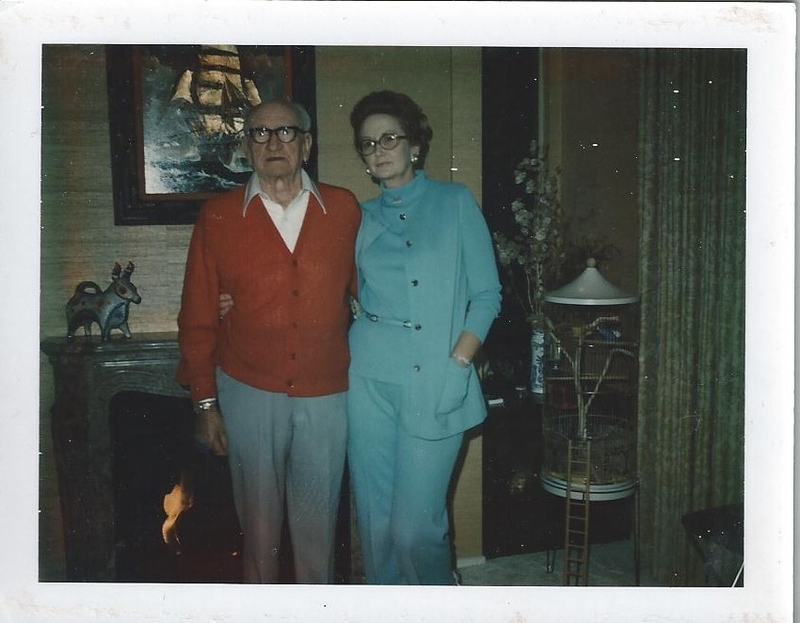 Growing up, I knew very little about my great-great uncle; only that his wife, my aunt Betty, loved him beyond measure. She often referred to him as, “My Tom.” They did after all, spend forty-two years together. Their relationship, however, wasn’t exactly conventional. They met in 1937 (incidentally, the year of Folsom’s final execution) when she was seventeen. He was forty-six . . . and married. After Tom’s wife refused to grant a divorce, the two carried on an affair until 1968 when Tom’s wife died and the pair married. Little is known about Tom except that he was a bookie, a self-described professional gambler, and that he had a “heart of gold.” I also know that during prohibition, he and his father smuggled bootlegged liquor to the Hearst Castle. My grandmother recalled a story he told about the San Francisco earthquake of 1906. Apparently, Tom’s father or brother, was the fire chief of the city. They enlisted Tom, a then-teenager, and his friends to help in the aftermath. With the streets in ruins, it was nearly impossible for horses and carriages to navigate the city, so on roller skates, the boys collected bodies and brought them to the morgue. After forty-two years together, it’s odd to not have some recorded family history, but they weren’t the most forthcoming duo. Much of that had to do with the fact that Tom had a wife. Another, was Tom’s chosen “profession.” His circle of friends and acquaintances included Bugsy Siegel and he even become a silent partner in the Stardust Hotel in Las Vegas with the legendary bootlegger and gambling entrepreneur, Anthony Cornero. Despite the ties to organized crime, Betty was always quick to point out that Tom “never crossed the line” into that world. Sometime in the ’40s, Tom made a trip to Folsom prison to collect money from an inmate. You couldn’t hide from a bookie in prison. I don’t know if Tom got what he came for, but he did leave with a box of mug shots. “The warden gave them to him,” Betty later said. They were placed in a closet and stayed there until the early 1980s. Tucked in with the pictures sat a 40-page text chronicling the history of Folsom from the early 1880s to 1943, presumably when it was written. Betty (who had a flair for drama) showed them to me and the family on one of our trips to see her in California in ’88 or ’89. These photos were freaky and awesome at the same time. We warily looked through the pictures, fearing somehow, the fiendishness of the subjects would rub off on us. Some had on bowler hats, others bowties. A few had their hair smoothly slicked back, while others appeared disheveled and unkempt. The pictures spanned a number of years, as evidenced by the mens’ evolving fashions and mustache styles. Some mug shots depicted a friendly, neighborly-looking kind of guy, or even a schoolteacher. Others fit the criminal stereotype with their shifty eyes and menacing stare. Many looked downright surprised or stunned, not unlike a typical driver’s license photo. The pictures and document remained with Betty, but she supplied us with copies of the text. 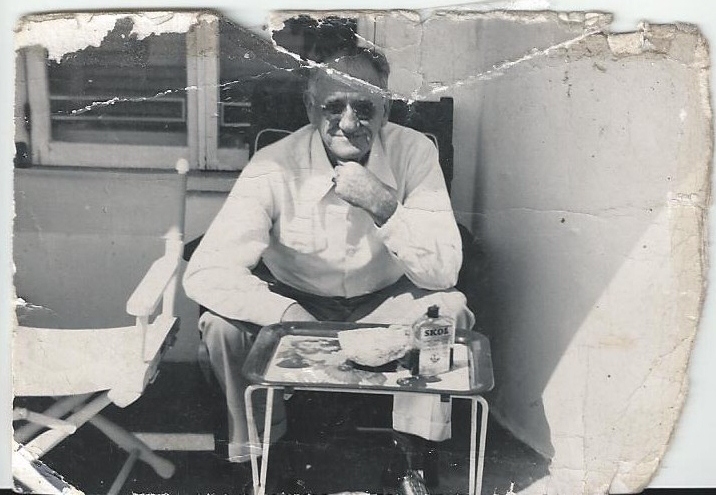 As I grew older, I stored Betty’s unusual treasure in the back of mind, recalling every so often that my great-great uncle visited Folsom prison once and brought back creepy photos of inmates. So anyway, that’s how the book began and with any luck, it’ll be available next spring from Linden Publishing. I owe Tom a debt of gratitude for hanging on to these antiquities, because without them, I’m not sure these stories would have been told. Categories: Folsom History, Writing Process | Tags: Anthony Cornero, Bugsy Seigel, Folsom Prison, Folsom's 93, mug shots, stranger than fiction | Permalink. Thanks for sharing. I learned even more about your great-great uncle. I always love hearing the story behind a writer’s book. Fascinating stuff, April. Tom must have been a very interesting guy. This is such an interesting story! I can’t wait for the book. I was doing a cross reference of Tony Cornero and found this….how funny! It is amazing that your uncle knew Tony Cornero. The fact that Tony went to the Preston School of Industry when he was a minor, that I wrote about the history of Preston, and you and I became friends via your book about Folsom, which all started back from the photos that belonged to your uncle, just amazes me!! Talk about six degrees of separation!! Your uncle sounded cool. Thank goodness he saved the photos for you to tell the history. You did a great job with the book. Ha! You can’t escape me! 😉 That is pretty funny . . . I wish I knew more about the connection between the two men, but that’s about all I know. I’m looking forward to reading your next book, too!